Did the loop around Hanging Rock State Park today. There was a rippin’ tailwind out of the Southwest. Instead to spending myself on the trip up and back, I drove to Hanging Rock. I, know, I know…. 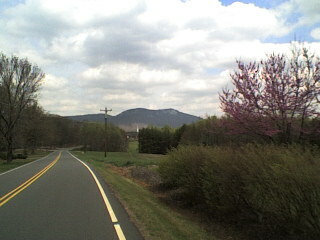 At any rate, I took it easy, climbed Sauratown twice and heading back around the southside and back to Hanging Rock. Did I mention the 2omph winds out of the southwest? Climbing back up Hanging Rock was an effort. I usually do that climb first, and hadn’t noticed how much steeper it is than Sauratown. Climbing at my incredibly slow cadence and speed, who did I run into coming down? Tailights and Chum, you guess? Absolute! They left me a smart alec note on my car windshield. Hiking indeed.